Chess will never be the same! Knightmare Chess is chess played with cards - and what cards! Each card breaks the rules in a wild and unpredictable way, giving the game more twists and turns than a roller coaster. A translation of the popular French game Tempete sur l'Echequier by Pierre Clequin and Bruno Faidutti, Knightmare Chess has 80 big, beautiful cards. 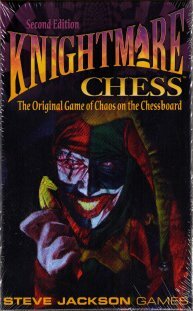 I haven't picked up a new copy of this game yet, but I did play many, many games of Nightmare Chess as a teen. Chess itself is often an unbalanced game, given the importance of experience among players and the prevalance of experience (who hasn't played chess?). Throwing in this deck of cards adds chaos, new blood, and an evening hand to the game. Even a highly inexperienced player can do impressive things with the cruch of an overly powerful and well-played card; similarly, an experienced player who manages his cards poorly can easily find himself in a losing position.